Long tubular white, pinkish, or sometimes cream flowers, viscid-glandular outside. Nativa y cultivada en Colombia; Alt. 100 - 2600 m.; Amazonia, Andes, Orinoquia, Valle del Cauca. 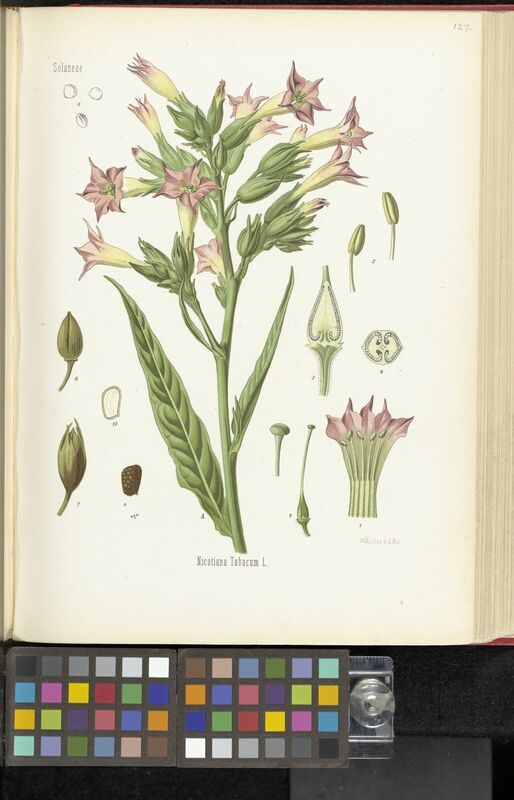 Annual or short-lived perennial herb to 3 m.
Known throughout the world as the common tobacco, N. tabacum is widely cultivated for its stimulatory effect, with many cultivars also being grown as ornamentals for their varying flower colours and strong evening fragrances. 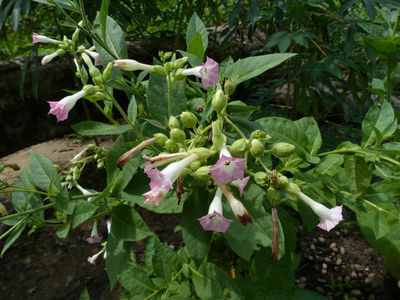 It is a highly polymorphic species now composed of a large number of cultivar forms used in modern tobaccos. Many more synonyms of this species are given in Goodspeed (1954) and Mansfeld (2001), who both summarise its amphidiploid origin from N. sylvestris Speg. & Comes and N. tomentosiformis Goodspeed. 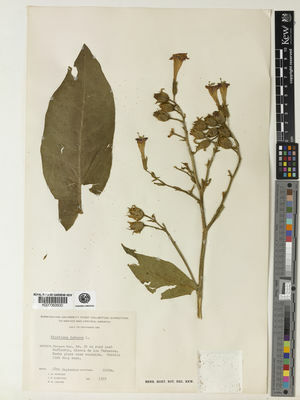 Plants were cultivated and the leaves already used for chewing and smoking in Mexico, C America, Venezuela, Colombia and Guyana before the Americas were discovered. It is now the most important commercial tobacco species, widely cultivated in the tropics and subtropics and some temperate zones, with the largest cultivation area encompassing China, India, Brazil, the former Soviet Union and the USA. Nicotine content is lower than in N. rustica; edible oils have recently been extracted from its seeds (Mansfeld, 2001). Among the many described varieties of this species are nine by Dunal (1852) and two in the Congo by Durand & Durand (1909), though none of these varietal names have been encountered on East African material. 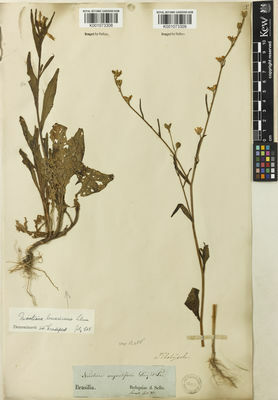 Williams (in U.O.P.Z., 1949) listed N. plumbaginifolia as occurring in Pemba and Zanzibar. The discriminatory characters given do not accurately reflect those given by Goodspeed (1954) for this species, with many being similar to those exhibited by N. alata. It is probable that the specimens were mis-identified. Said to be cultivated in Uganda in F.P.U. : 129, but no specimens have been seen. Type from America: Linnean specimen 245.1 (LINN, lectotype, IDC microfiche neg. 136.I.6! ), fide D'Arcy, loc. cit. (1974). Annual to short-lived perennial herb (0.5)0.6–1. 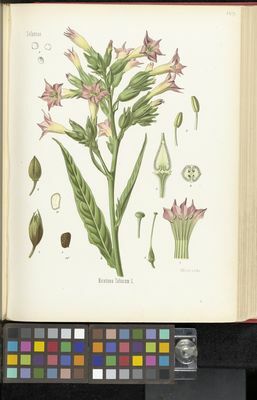 5 m tall (elsewhere said to reach 3 m), somewhat bushy below, somewhat viscid, shortly glandular-pubescent Annual to short-lived perennial herb (0.5)0.6–1.5 m tall (elsewhere said to reach 3 m), somewhat bushy below, somewhat viscid, shortly glandular-pubescent. Ovary 3–7 × 2–3.5 mm, conic or ovoid, glabrous. Riversides and riverbeds, anthills, in old cultivated ground and waste places; up to 1460 m.
Flowers often many, erect to nodding, in broad, loose, flat, sometimes rounded at the top, several–much-branched, spreading, glandular-pubescent, paniculiform inflorescences up to 23 cm long, terminal and axillary; bracts foliaceous, clasping; bracteoles small, linear to foliaceous, often ephemeral; pedicels (2)5–17 mm long, slender, later markedly thickened distally and 10–20 mm long, ± erect in fruit. Flowers often many, erect to nodding, in broad, loose, flat, sometimes rounded at the top, several–much-branched, spreading, glandular-pubescent, paniculiform inflorescences up to 23 cm long, terminal and axillary; bracts foliaceous, clasping; bracteoles small, linear to foliaceous, often ephemeral. Ovary 3–7 × 2–3.5 mm, conic or ovoid, glabrous; style 2.5–6 mm long, straight, glabrous. Nicotiana tabacum var. undulata Sendtn. Del Guacchio, E. (2015). Integrazioni, aggiornamenti e note alla flora esotica della Campania Informatore Botanico Italiano 47: 147-154. Majumder, S.C. & Chakrabarty, T. (2009). 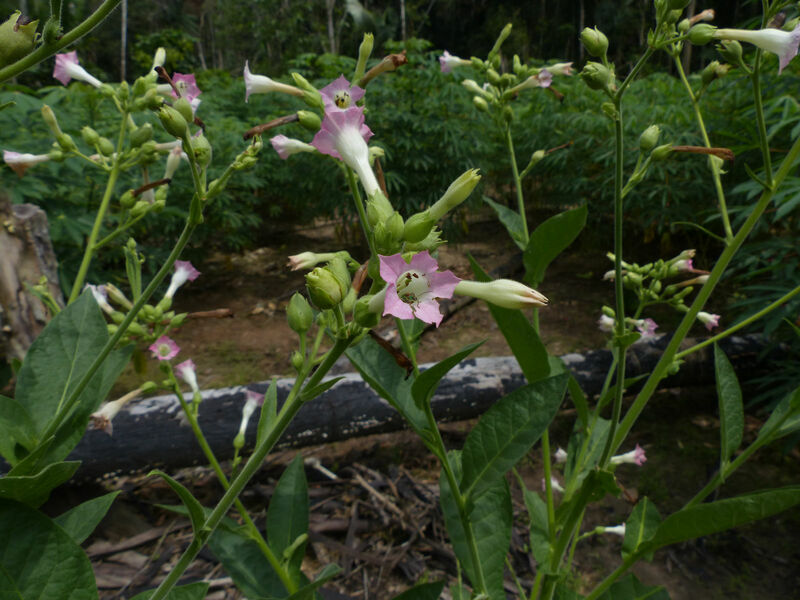 A census of the genus Nicotiana L. (Solanaceae) in India Journal of Economic and Taxonomic Botany 33: 545-548. Symon, D.E. (1985). The Solanaceae of New Guinea Journal of the Adelaide botanic gardens 8: 1-171. Fl. Cabo Verde, fam. 71: 65 (2002). Agnew, Upland Kenya Wild Fl., ed. 2: 245 (1994). Fl. Libya 62: 18 (1978). Ann. Missouri Bot. Gard. 60: 658 (1974). Fieldiana, Bot. 24, 10: 78 (1974). Sci. Tecn. Agr. Ano viii, 11: 15 (1968). Bull. Jard. Bot. État 33, Suppl. : 883 (1963). Watt & Breyer-Brandwijk, Med. & Pois. Pl. S. & E. Africa, ed. 2: 962, 984 (1962). Chron. Bot. 16: 372, 373, 375, fig. 74 (1954). Ficalho, Pl. Ut. Afr. Port., ed. 2: 231 (1947). Robyns, Fl. Sperm. Parc Nat. Alb. 2: 218 (1947). Bol. Soc. Estud. Colon. Moçambique 32: 88 (1936). Bol. Agric. Pec. 1: 25 (1930). T. & H. Durand, Syll. Fl. Congol. : 397 (1909). F.T.A. 4, 2: 259 (1906). Akad. Wiss. Wien. Math.-Naturwiss. Kl., Denkschr. 78: 438 (1905). De Wildeman, Miss. Ém. Laurent 1: 177 (1905) , 442 (1907). Engler, Pflanzenw. Ost-Afrikas C: 356 (1895). Peters, Naturw. Reise Mossambique 6: 231 (1861). A. de Candolle, Prodr. 13, 1: 557 (1852). Fl. Eth. 5: 106 (2006).